Revel Motivation Science presents classic and contemporary approaches to the study of motivation in a way that is fun, dynamic, and relevant to students’ lives. Combining insights from psychology, education, health, business, and sports, authors Edward and Melissa Burkley emphasize the influences of cognitive, emotional, social, and biological processes upon motivation. Using simple, engaging language, real-world examples, and compelling pedagogical features, the text helps students see how they can apply concepts from the field to achieve their own life goals. NOTE: This ISBN is for a Pearson Books a la Carte edition : a convenient, three-hole-punched, loose-leaf text. 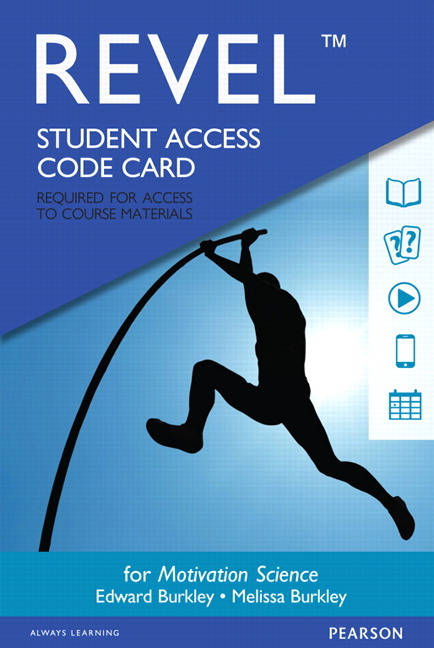 In addition to the flexibility offered by this format, Books a la Carte editions offer students great value, as they cost significantly less than a bound textbook. 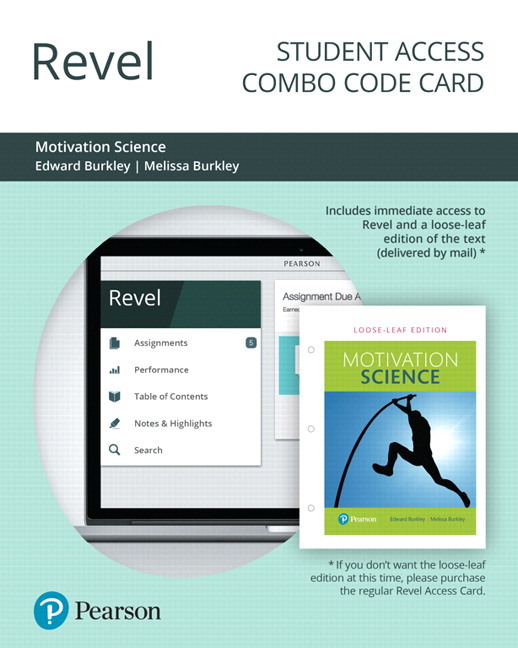 Motivation Science is also available via Revel ™, an interactive learning environment that enables students to read, practice, and study in one continuous experience. Learn more . Presenting coverage of both classic and cutting-edge approaches to the study of motivation, the authors emphasize the combined influence of cognitions, emotions, neuroscience, unconscious processes, and biology in the study of motivation science. In order to reinforce the study of motivation science’s relevance of in real-world situations, the authors provides insights into the reasons why people often fail at their goals, and explain techniques that may improve students’ future goal pursuits. The text helps students to recognize and understand the primary motives known to influence human behavior — namely the needs for autonomy, competence, and belongingness. Separate chapters on goal setting, goal planning, and goal striving help students develop a deep understanding of the goal-achievement process. Annotated graphs help students better understand data. 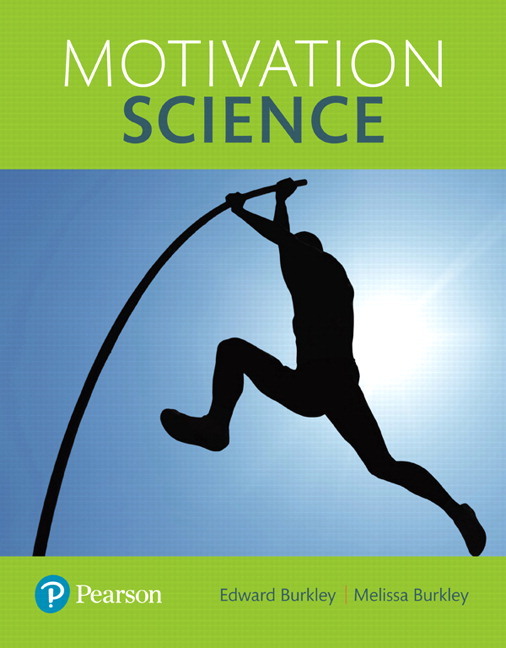 Motivate Yourself features offer simple tips for how students can use motivation science to improve their own lives. Try It! activities help students engage with the course material. The long-term ProjectMe feature prompts students to apply course concepts to a self-selected goal over the duration of the course. Edward Burkley is currently an associate professor in the psychology department at Oklahoma State University. He received his Ph.D. in social psychology from The University of North Carolina — Chapel Hill in 2006. His research focus is on motivation and self-regulation. His research focuses on the role of the self in motivation as well as developing new motivation measures. He has published in the Journal of Personality and Social Psychology , Personality and Social Psychology Bulletin , and Self and Identity and his research has been featured in New Scientist and the APA Monitor . Melissa Burkley is currently is an associate professor in the psychology department at Oklahoma State University. She received her Ph.D. in social psychology from The University of North Carolina — Chapel Hill in 2006. Her research focus is on implicit prejudice, stigma, racism and sexism. She has published in the Journal of Personality and Social Psychology , Journal of Experimental Social Psychology , and Social Cognition and her research has been featured in several national media outlets (e.g., The New York Times , Oprah Radio). She also writes blogs for the Huffington Post and Psychology Today . Every semester, she teaches a motivation course utilizing the techniques outlined in this text.